What is this? Animal Planet? That’s a tree right in front of our house. Know what’s in that tree? No? Shall we take a closer look? That’s a raccoon. In our tree. Staring at us. At 6:30 last night. Our neighbor said that the raccoon lives in a tree next to his house with its babies. Its babies. When our dogs alerted us to the raccoon in the front yard, Mark went running out with the camera. I stayed safely inside with Charlie and called animal control because, seriously, it can’t be normal to have a raccoon running around in the daylight, climbing trees, and staring at you. The woman at animal control said it was fine. Frankly, I found her to be just a little too calm about the situation. “But what about rabies?” I asked. She said that if the raccoon was rabid then it would be stumbling about. Then she said , “If the raccoon was well enough to climb a tree, then I doubt it has rabies. Just ignore it.” Ignore it? Yeah, she had no idea who she was talking to. About a lifetime ago, I went on a study abroad program with about 15 other American college students to rural Kenya. My dear friend Jen was horrifically afraid of black mamba snakes. Inexplicably, I was not. All I can guess is that my gene that codes for the ability to recognize and respond to danger was not fully working until the day I gave birth to Charlie. Now it makes up for lost time. Anyhow, a Kenyan friend told Jen that black mamba snakes can drop out of trees. I don’t know if that’s true or not, but from that day on, Jen aimed to carry an umbrella with her everywhere she went to ward off overhead mamba attacks. I mocked her for it. And now the karma gods are laughing at me. 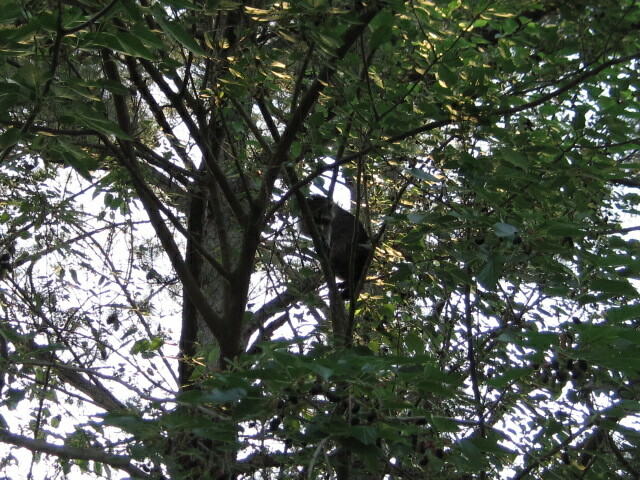 It never occurred to me, not even remotely, that a raccoon could be in a tree as we walked underneath it, waiting to decide if it will pounce down on top of us. After about 15 minutes the raccoon came down the tree and ran off toward the neighbor’s house. When Mark announced that the coast was clear, I came outside to water some plants. That’s when I saw the thank-the-good-Lord-it-was-dead snake in our driveway. 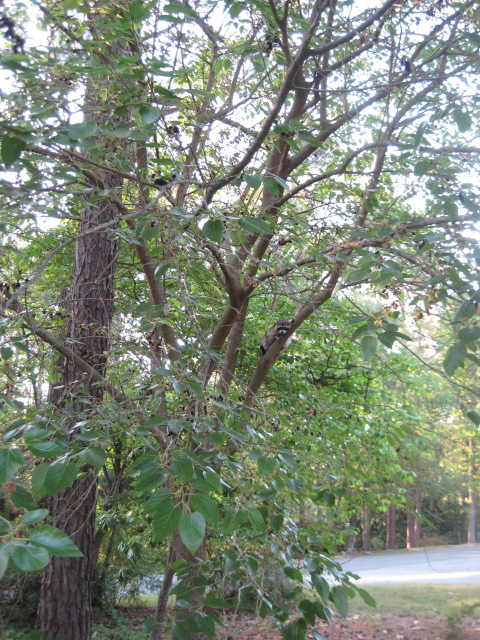 Mark then told me he had seen two huge turkey vultures or black vultures standing in the road in the neighborhood on a dog walk a couple of nights ago. These are massive birds. And highly unfriendly. Then he mentioned seeing two, very-alive Copperhead snakes on another dog walk. And tonight, after Charlie went to bed, he saw a deer standing next to our car in the driveway. Staring at him. What is this?! Animal Planet?! Alright, I’m joking. But if you happen to be in central North Carolina and see a family of three walking around in plastic bubble suits, please do come over and say hello. That raccoon is cute. She is a mother. Remember they work in teams, high degree of socialization. Deer don’t bite. Now the snake is another thing entirely, but I bet the compost pile would welcome him. When does the stove come? Those bubble suits can be purchased at Walmart with coupons. Now the vulture turkeys are not velociraptors(don’t know how to spell that, and anyway they live in Jurassic Park ). The dogs will keep the raccoon away. Pretty raccoon! I have buzzards swoop down and catch mice. That’s kind of exciting. This post made me laugh and laugh. But seriously, dude, city apartments in Chicago have less danger. Yes, Anne, the predators have TWO feet. I’m honestly not sure what the whole story is here because once I got to the word “snake”, I stopped reading and just looked at the pictures. But I wanted to advise that, WHAT EVER you do, DON’T look a raccoon in the eye. Paula has a phobia about snakes. She and your friend Jen could have huddled under the umbrella together. This post may have killed the chance of any warm weather visits from the two of us….and I’ll just pipe up that you haven’t even mentioned the North Carolina BUGS…. Are snakes around in cold weather? I’ll take my predators on two feet please. I failed to mention the bugs as well as the fox that was hanging around our yard for a couple of months not long ago. If we’re choosing predators, I just vote that they HAVE feet period. A one-footed mugger is easier to run away from actually. Yes, but he can swat you with his crutch. How about one with a freshly sprained ankle? Crickey! They are not mountain lions, just raccoons. I say you three paint masks on and become one with your neighbors. Don’t just see the raccoons – BE THE RACCOONS! This is easy for you to say since you live in a concrete jungle.